Microsoft Corporation became a sponsor of Horizon Home Page for the 199697 academic year, thus joining Jossey-Bass Publishers in helping us develop the Web site as a major Internet resource for educational leaders. James Ptazynski, strategic relations manager of Microsoft's Higher Education Group, said that their sponsorship was "congruent with Microsoft's purpose to assist educational organizations and educational leaders in integrating technology in curricula, instruction, and in administration. Horizon Home Page is a valuable resource on the Internet; we feel that we can achieve these objectives through helping you continue what you are doing." And what are we doing on Horizon Home Page? First, we are developing two on-line monographs on integrating technology in instruction, one for college and university teaching and one for K12 instruction. The college and university monograph was published by Microsoft in CD-ROM form late this fall; we will keep the chapters on our Web site and add to them as wellwe are continuing to solicit manuscripts on this topic. (There is a good possibility that this will be a continuing project, with Microsoft publishing new chapters in an annual CD. BTW (Internet speak for "by the way"), the period of time from initial conceptualization of the project to publication was less than six months. The K12 monograph will be published in CD-ROM form in the spring of 1997. Microsoft will send a copy of either CD free of charge to any U.S. teacher or administrator at the appropriate level, and for postage only to those outside the country. In addition, we have developed an electronic newsletter on how educators are integrating technology in their organizations. You can contribute to this newsletter. Send me examples, success stories, tactics, issues faced, and lessons learned in your effort to use productivity tools in improving organizational efficiency or in improving student learning. 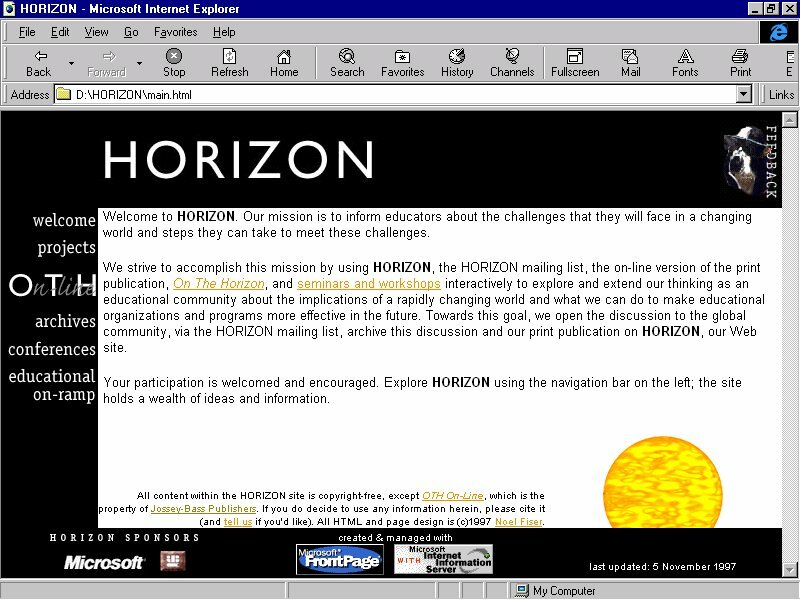 For example, UNC-CH School of Education (SOE) is now using the latest Microsoft NT server software to connect Macs and IBM-compatibles, which has allowed us to establish an intranet for internal communication as well as to have our own Internet server (all courtesy of Microsoft sponsorship of Horizon Home Page). For a glimpse of our new look, see Figure 1. Within the next six months, we will write an article for the electronic newsletter describing SOE's Internet information server included in NT, how we have used it to address the issues of faculty and student interaction and work, and how Microsoft NT, Office, and Exchange Server have enabled SOE faculty to work more effectively with the public schools we are partnered with in the professional development school program. These activities are described in the special projects section of Horizon Home Page. Other projects in this section include a special issue of the High School Journal on the future of secondary education that we developed on-line and that was published at the beginning of this year, the proceedings of various workshops and seminars on using tools that help us anticipate and plan for the future, a page that I use to teach courses in educational leadership and technology at UNC, and a page on instructional resources for teachers who teach via the Internet (for example, links to style books on how to reference electronic publications, how to make effective presentations, how to use Internet search engines). Finally, we have a section on issues challenging education where a number of people have contributed analysis papers on such matters as charter schools, distance learning, changing contexts of higher education, and a national curriculum. We have other useful sections. For example, on one page we archive past issues of On the Horizon; on another we archive the draft articles submitted for publication consideration and the discussion that occurs on Horizon List vis-a-vis these articles; on another page we have a futures planning database organized in the STEEP sectors of articles previously published in or submitted for publication consideration for On the Horizon. Our conference section contains notices of major conferences that focus on some aspect of the future that can affect educational organizations. Our last section, "Educational On-Ramp," has a number of valuable links to information sources in the STEEP sectors (for example, the Library of Congress, the Bureau of the Census), to media sources (for example, the New York Times, CNN), and to educational associations. We promise to continue to build Horizon Home Pageand, thanks to the generous support of Microsoft and Jossey-Bass, we have the resources to do so. We can use your help as well. Please send me notices of conferences that we should have in our conference section, or send me Web sites that we need in our On-Ramp section (STEEP sector resources, news organization sites, or relevant association sites). We want to make Horizon Home Page your home page. Help us do so. All material within the HORIZON site, unless otherwise noted, may be distributed freely for educational purposes. If you do redistribute any of this material, it must retain this copyright notice and you must use appropriate citation including the URL. Also, we would appreciate your sending James L. Morrison a note as to how you are using it. HTML and design by Noel Fiser, ©2006. Page last modified: 7/3/2003 9:48:10 PM. 16522 visitors since February 2000.